The question of what is a civil court case is a familiar question. 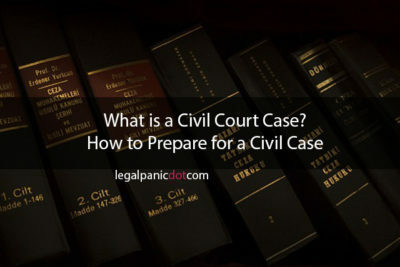 What is a Civil Court Case is always asked in most legal gathering or platform by non-lawyers and lawyers alike. A Civil Court Case is simply a court case that is civil in nature. It is every case that is not criminal. The parties are either Plaintiff or Claimant and Defendant. Here, the parties to a civil case don’t involve the state as a prosecutorial party. The parties in a civil court case are not expected to prove their innocence like in a criminal case but they are expected to prove their case to win the other party. A civil case is simply put as a non-criminal case but a case between individuals (can on few occasions include the state as a party as defendant) eg. Divorce, Family Law, Tort, Contract, Probate, Commercial cases, etc. In Civil cases, the reward for a winning party is usually declarative and claim for damages. Going to court can be intimidating – even if it’s just a civil case. Sometimes, especially if it’s a civil case. The best thing you can do to ease your nerves is to prepare. Here’s how you can do just that. So, you’re getting sued. Ideally, you want to do everything in your power to stop your civil case from going to court. Ideally, you want to prevent this from going before a judge – to make the other party back off. Don’t panic. You can do this. People, both plaintiffs, and defendants win civil court cases all the time. While there’s no guarantee you’ll come out of this victorious, the more preparatory work you do, the better your chances. There’s a common saying amongst lawyers and attorneys about people who represent themselves in court. They’re fools. Even if you think you have a good handle on the law – even if you’re certain you have a strong enough set of arguments and enough charisma to power your way through, don’t. Unless you’re a lawyer yourself, there’s absolutely no way you know more about the law than someone who’s spent years – decades, even – studying it. And even if you are an attorney, there’s a good chance you’re so close to the case that there are details you’re missing. You need a lawyer not just for their legal knowledge, but so you can bring in an impartial third party that can step back and see the bigger picture of your case – someone who is neither emotionally involved nor directly at risk if the case doesn’t go well. Once you’ve tracked down an attorney, your next step is to work with them to iron out the specifics of your case. Start with the facts. You want to take an objective look at your situation before getting to your perspective. Who is involved, and how are they involved? What were the specific events that brought this case to court? What claims are being made by the opposing party? What claims are being made by you? What will happen if you lose this case? What will happen if you win this case? What laws or legal procedures are relevant to this case? With the concrete facts on paper, it’s now time to drill down into what you’re trying to prove (and how you’ll prove it, but we’ll discuss that part in a moment). This is known as the theory of your case – the core from which every argument and piece of evidence will branch out. Whatever your argument, you need to make sure it’s a convincing one. Let’s say, for example, you’re a restaurant owner who’s being sued by a customer who injured themselves while they were there. They’re claiming you didn’t take the necessary precautions to make your establishment safe for its clientele. That’s where your theory starts – you want to prove that their claim is incorrect and that you did everything that could reasonably be expected of you. That although their injury was still unfortunate, you are not directly at fault for it. Depending on the details of the case, you might even take things a step further. You might even try to prove that they’re faking their injury – to poke holes in their story that casts reasonable doubt on their claims. Your own testimony – what did you see, and what do you know about the incident? Photos, reports, or records of the customer’s visit. In this case, you might pull the receipts from their meal, or an incident report was written up after their visit. During this process, you’ll also want to consider what evidence your opponent has. They might have medical records or eyewitnesses of their own. They might have physical evidence like photo or video. Depending on where you’re located, you may have a conciliatory meeting or a conference before your court date. This is an opportunity to see how strong your opponent’s case is compared to your own. If you’ve gathered enough evidence and presented a strong enough argument, you might be able to avoid the courtroom altogether. In a lot of ways, your body is kind of like a car. If you take good care of it and go through the proper maintenance routines, it can take you pretty much wherever you need to go. If you neglect it, it’ll eventually break down. Civil cases are stressful – there can be no doubt about that. But you cannot afford to let that stress weigh you down. You cannot afford to neglect self-care. If you’re exhausted, you aren’t going to be able to formulate strong enough arguments. If you aren’t eating, you’ll be too distracted to remember essential details. And if you aren’t dressed well or keeping yourself in decent shape, you’re going to make a horrible first impression in the courtroom. Eat. Sleep. Exercise. Dress well. And don’t forget to relax. Your body should be like a well-oiled machine – not a rickety old lemon. Civil cases can be nerve-wracking no matter what side of the courtroom you stand in. But provided you’re prepared and knowledgeable enough, they’re ultimately just like any other legal matter. They just require time, effort, and a decent lawyer.